Over the past 50+ years of consistent use of Pittsford Sutherland High School's pool, and with costs of maintenance and repairs rising each year, sustaining the pool was becoming more and more of a challenge for the District. The best solution was to drain it and use the space more efficiently. 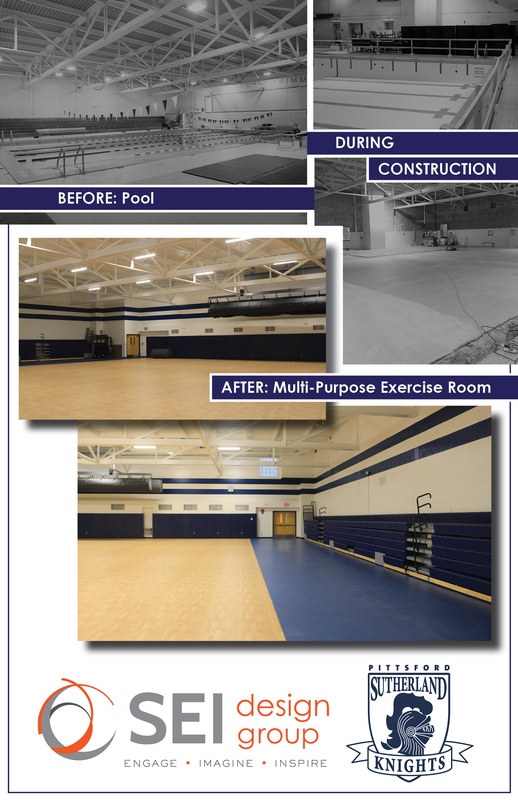 SEI Design Group worked with the District to re-purpose the defunct pool and in 2018 completed construction of the new Multi-Purpose Exercise Room. The renovation work to turn the Pool in to an Exercise Room included: the infilling the pool, updating the HVAC systems, providing athletic rubber flooring and wall mats, updating all of the doors, abatement of all asbestos wall tiles then providing gypsum wall board and paint, upgrading the bleachers, painting the existing ceiling including trusses, and replacing the lighting.